My student showed me a photo from his trip to Chiang Rai. Once I saw it, it made me laugh out loud. 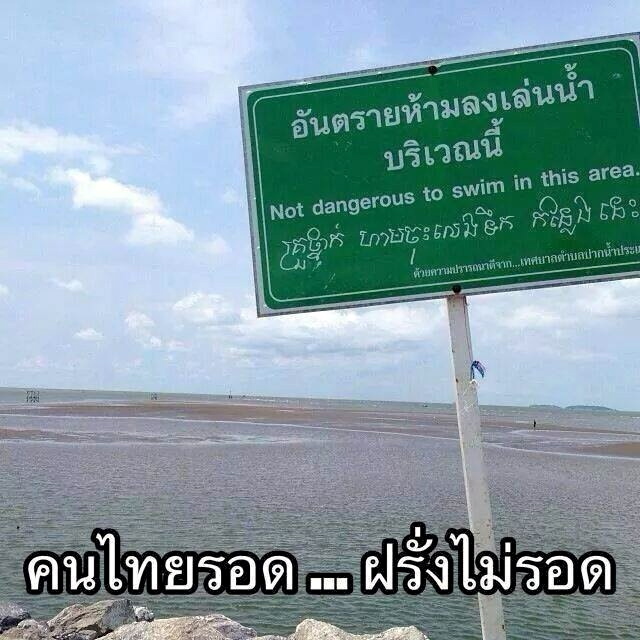 I would like to share it with you so we can also learn Thai from this photo. 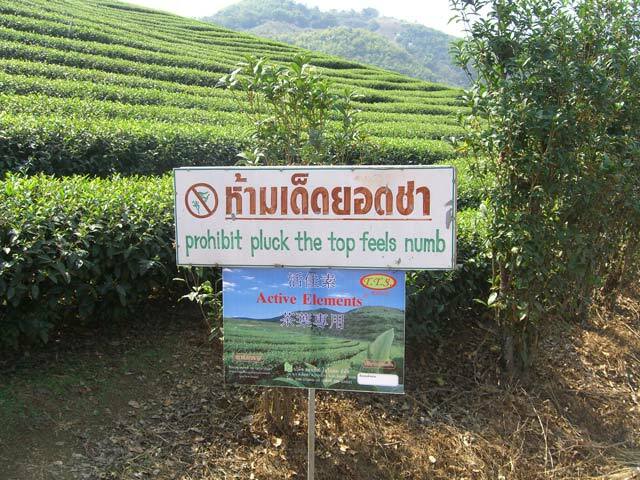 This is a warning sign from a tea plantation in Chiang Rai province in Northern Thailand. Chiang Rai is known for their abundant tea plantations. The sign in Thai says “ห้ามเด็ดยอดชา” , but what makes me laugh is the English translation “prohibit pluck the top feels numb”. I think you would laugh your bottom off like me if you understand the meaning of the Thai words used in the sign, so let’s break it down. ห้าม /hâam/ means to forbid, to prohibit. It is used to give a command to someone not to do something i.e. ห้ามสูบบุหรี่ / hâam sub bù-rìi/ Do not smoke. I think a person who translated the Thai text to English just searched each word from a dictionary and chose the first meaning he/she saw. When I was a student I also did the same thing, not knowing that a Thai word that has several meaning could be different words in English like the word ‘ชา /chaa/ here that means both ‘tea’ and ‘feel numb’ . Another similar cute mistake, I found the photo from the internet. Now we understand what the troubles are; the word เกาะ /gò/ and a misunderstanding how to use to use the word ‘forbidden’. 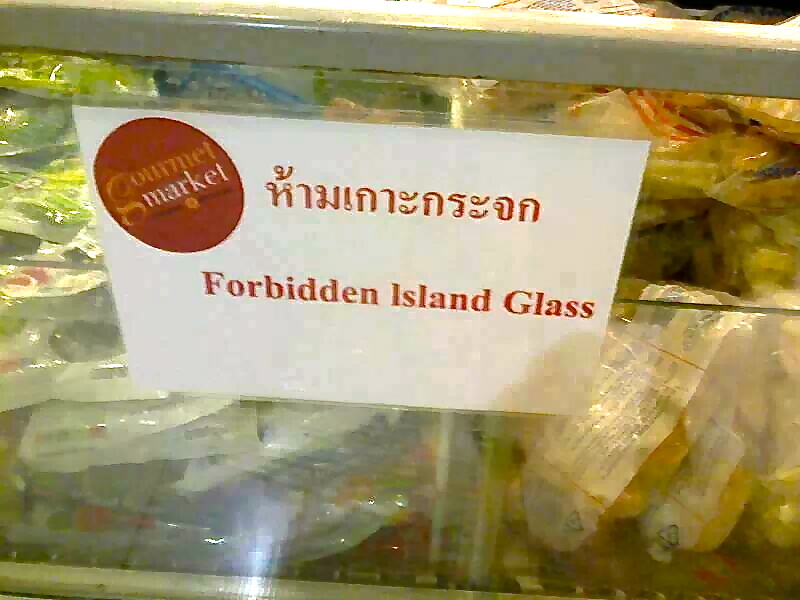 ‘Do not lean against the glass’ could be translated to Forbidden Island Glass. Well…it is better than Forbidden Island Mirror, huh? First look at this sign, it made me laugh. But thinking about reality it is NOT amusing because it could cause someone’s life. The sign in English is obvious, except the fact that it communicates totally the opposite message. ห้าม /hâam/ = prohibit. We use this word in the pattern : ห้าม/ hâam/ + do something = Don’t do something! 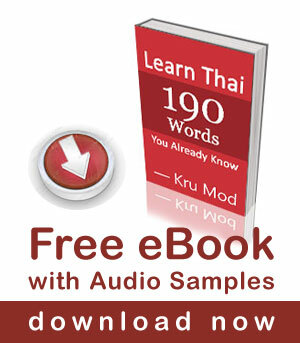 Perhaps, it is time for you to start learning to read Thai language. For your own safety. 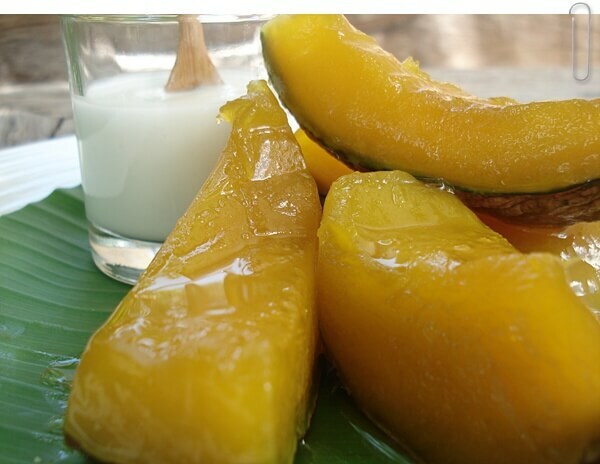 ฟักทองเชื่อม Pumpkin boiled in Syrup. 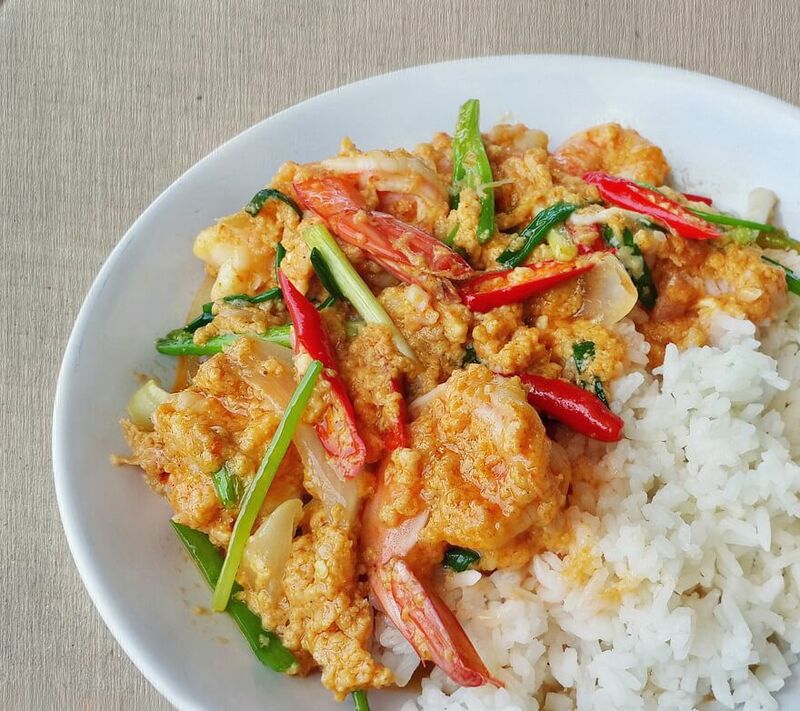 The dish number 7 is “กุ้งผัดผงกะหรี่ gûng pàt pŏng gà-rìi”. Let’s take a look at each word, shall we? กะหรี่ gà-rìi is a type of curry. This word is also a slang used to call a prostitute. ผงกะหรี่ pŏng gà-rìi is curry powder made of fenugreek seed, fennel seed, coriander seed, turmeric powder. This is all very well. But I have lost a few thai girlfriends and one girl lost a few times only to get back together again because of the poor translation apps or google. I dont seem to be able to exlain to her even, that its poor translation that is causing the problem . Its only that we seem unable to let each other go that we are still together , but the future always looks bleak for us . I cant possibly learn thai to any successful level before the next breakup . 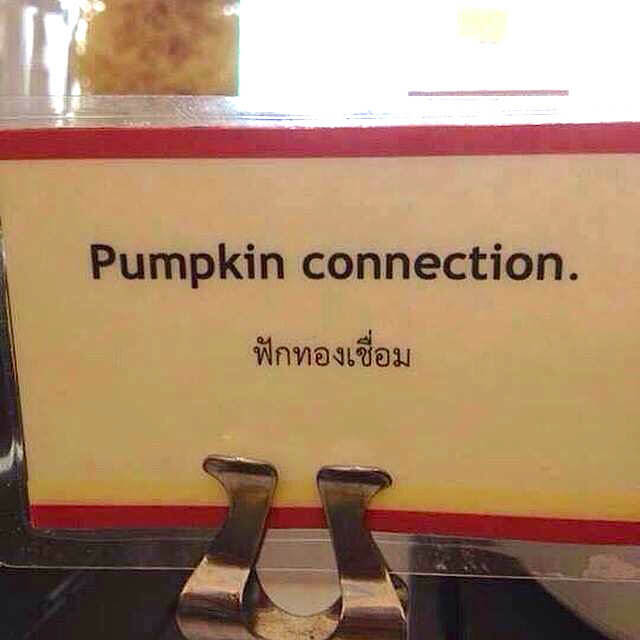 “Pumpkin Connection” would be a great name for a restaurant! Every language has interesting quirks. Example, in Arabic they don’t have the p sound. So sometimes you’ll see nicely made, professional looking road signs that say ‘no barking’. Makes you wonder how they pronounce Palestinian, doesn’t it? Thanks for pointing these signs out. English is so different from Thai, we should not expect perfect English. Thank you for sharing your thoughts with us. It is interesting to know how other languages are like. I moved to Thailand and married on sip ha macarakhun song pan ha roi ha sip pad, and I am having the hardest time trying to remember all the words my wife is trying to teach me. I would appreciate a little help in how you get the words to stick in the brain other than of course to repeat them a million times, as I really would like to be able to converse with my wife and family instead of just listening to conversations I can’t get involved in. Any suggestions? Sawatdii ka William, thank you for visiting my website. I always encourage my students to use what they have learned from watching my videos or from the lessons they are taking. Go ahead to talk to Thai people and don’t afraid to make mistakes. Watch Thai movies and listen to Thai songs even you don’t understand everything but you will slowly pickup words and it stays with you when you hear or see them from the context that you enjoy. 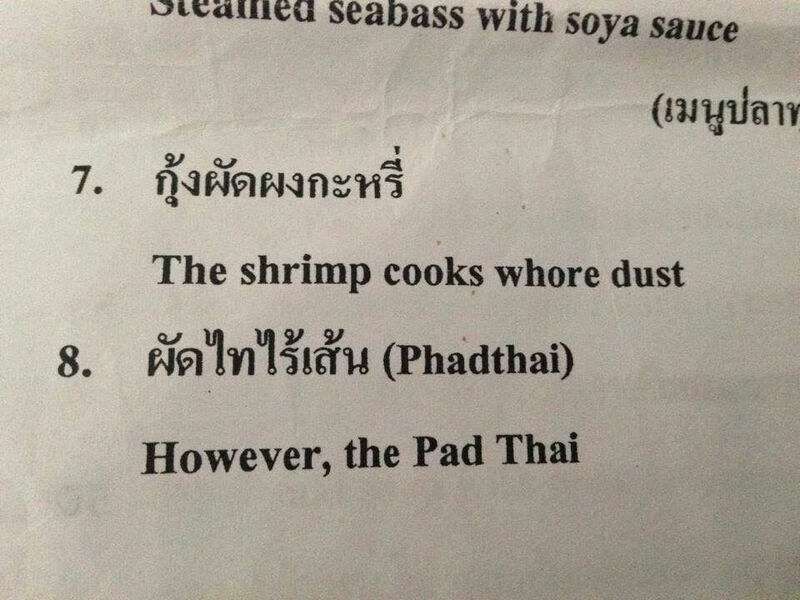 Dear teacher Mod, don’t you find it embarrassing with the not so seldom poor translations you often find in Thailand? Do you think it’s in order to point these things out when you see them or is that rude? Here at home near Philadelphia, PA, USA – there are plenty of mistakes on signs in English, so i agree with the writer that wrote that it was nice that the Thai people were making an effort to reach out to tourists – and intuitively, native English speakers would in most cases see though the error, i mean, often times we make copy/editing mistakes because we are focused on something else. How many of us have found typos in text that were not mispelled words but the incorrect word inserted by an Auto-correct feature. I really enjoy your efforts to expand Thai language learning and cultural awareness – Best wishes to the team at “Learn Thai with Mod”!!!! 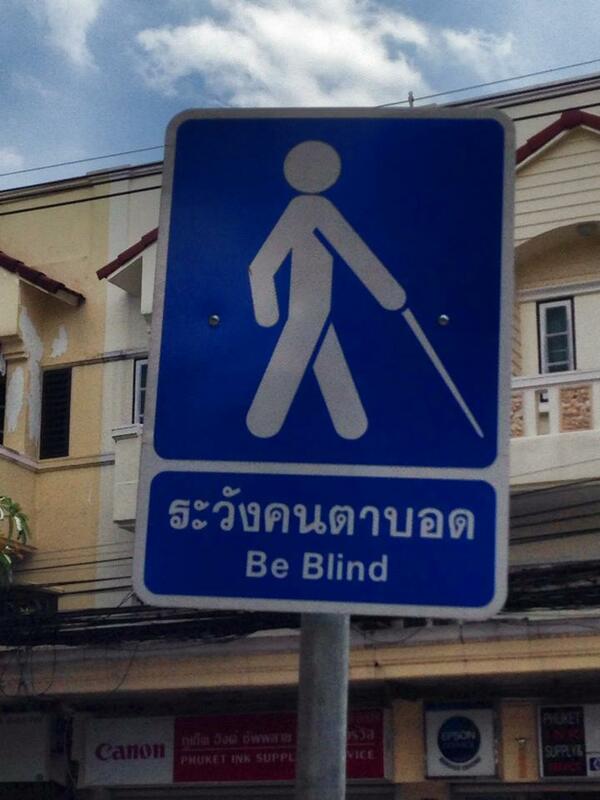 Now, as a student of Thai, I couldn’t help noticing what looked like a mistake in the paragraph on Be Blind. I think the “dawd” should probably be “bawd,” but I wasn’t sure so I spent time checking, and on the way to checking that, I learned some other things. So — even if it was a mistake, I learned from it! Just the way I learned from your funny signs. Thank you so much for the excellent video lessons and all you do for Thai learners. Shouldn’t this be read as ‘….it could cause the loss of someone’s life.’ ??? 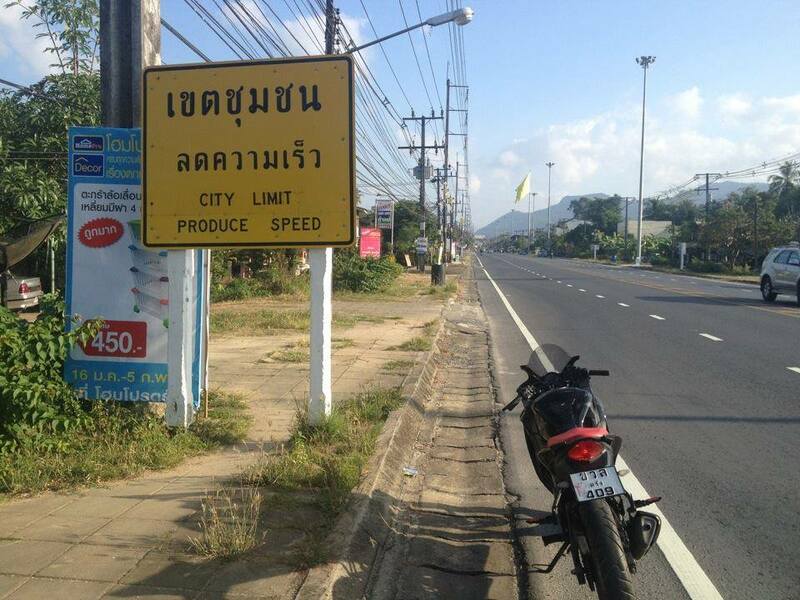 I love looking out for funny signs in thailand, all round the world really. But the dangerous swimming in water one is really bad, an icon with a swimmer and a slash to symbolize the no swimming would be the least the authories should have done. Duh..
Thai people are very self conscious, not daring to speak english for fear of mistakes. But thats how you learn new languages right? Mistranslation on signs, menus, etc are a big part of my enjoyment of traveil. With over 75 countries visited, I’ve seen quite a few hysterical mistranslations. English speakers make mistakes when translating too! Q: Where is your wife? President Kennedy flubbed his line in his famous Berlin Wall speech. The Germans could have laughed, but understood what he meant and were gratious.You see, the US President used the wrong case of the indefinite article “a” (ein/einer) which changed the meaning of the noun. So “Ich bin ein Berliner” meant “I am a Jelly Filled Pastry”. Good thing he wasn’t in Vienna. I’m guessing but I bet ‘cha’ is the Chinese word for tea and as they were the first ones to export it around the world theIr name for it just stuck. Gee, kruu Richard, I bet your lessons are bags of fun! Thanks for another great lesson Mod, interesting as always!! Mainly, just a quick note of “Thanks!” for such a wonderful site, one that is both very instructional and very entertaining. For those who visit your site, however, to learn and/or practice English, you should be more aware of what you post since I found the following sentences rather awkward to my ears. “First look at this sign, it made me laugh. But thinking about reality it is NOT amusing because it could cause someone’s life. Have you heard of PG Tips? now I see why when I use the translate on my computer I sometimes do not fully understand what my Thai friend has posted in her own language . My computer is giving me the wrong meanings sometimes. In portuguese (I’m brazilian) tea is chá. It’s writting very similar to “cha-a” and I wonder if the pronounce is similar too. Sorry my ignorance, but what language do you speak in Philippines? The word cha is from Chinese (茶). That’s why it is ‘cha’ in a many languages. In the Chinese Hokkien dialect, it is ‘teh’ which went into English as tea. It’s hard to imagine someone looking up each word to make a sign, but they sure didn’t use google which put it as “Most decidedly not Tea.” Google for the win? There are thousands of such little mistakes throughout the world – it is important for one’s sanity that one learn to smile (and occasionally laugh) at such harmless things, for the world is filled with things that are not funny at all. From your response, it would seem that you are struggling to come to terms with the shortcomings of some aspects of Thailand – I would suggest a slightly more ‘sabai sabai’ approach… getting seemingly annoyed/wound up over such matters will often mean you will most likely find yourself at loggerheads with most things Thai. May I be so bold as to suggest reading some Buddhist scriptures, practicing meditation and trying to prioritize a little better? Very embarrassing to Thailand and the tea company. Who wrote this, who didn’t check with someone who knows English better. It’s quite inconceivable that someone who works with tea doesn’t know that chaa means tea in English. Who was overseeing this. It’s a sad reflection on Thailans’s educational system. I see these kind of misktakes everywhere, on street signs and on Thai websites, everywhere, why???? Sorry, I don’t think this is funny. At least they try to translate, in many parts of the world they wouldn’t have even tried. And more than ignorance of thais I think this reflects the bad manners of some tourists because if they feel the need to translate into english, it means that tourists do pick tea leaves. As suggested by someone else, just smile, world has already many things to be angry with, this can be seen as just a funny mistake . I’m a late comer to this discussion but I think, Khruu Richard, that you need to lighten up a bit. That sign was funny. The fact that Khru Mod used it as an example is not disparaging to Thai culture; it’s just an example of how things can be mistranslated. As for the state of Thai education, have you taken a look at posts by American students lately? (The USA is where I currently live.) I’m taking an online writing class and let me tell you, some people have never heard of electronic spell checking. They are probably not aware that dictionaries exist either because they’ll write “comma” as “cama”, suspicions as “suspensions”; the verb ” to breathe” becomes ” to breath”; and forget about making the difference between “its” and “It’s”. So, please, before you make any comment, do a little research will you? And remember: Thai people love things to be “sanuk”. Huh, Richard, you might want to put one of those four question marks at the end of the second sentence. While you’re at it, you could use one after “Who wrote this?” And since that leaves two question marks out of four, the third would be in a good spot if it were placed at the end of ” Who was overseeing this?” Just saying. Dont M i s k t a k e s Rickard ? Your videos on youtube are so good, it made me want to explore your website. I think at least I must say a thank you for all your free lessons. I am happy to hear that you enjoyed my video lessons. I hope you will find my site useful as well.